Bitzer Part-No. Supply Order No. The SE-B2 motor protector has been developed especially for the use in cases with a higher starting load or for drives with a high switching frequency. SE-B2 Motor protector matches with PTC sensor and is available for all kinds of motor which needs protection, preventing overheating of the electrical machines. 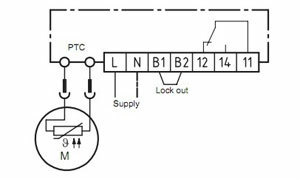 At the measuring circuit input of the SE-B2 (orange wires), it is possible to connect up to nine DIN 44081/082-conform PTC sensors. Sensors with different nominal response temperatures may be used. Hence it is possible to monitor several measuring points with only one SE-B1 motor protector. If the temperature in one of the monitored parts or sections exceeds the nominal response temperature of the respective PTC sensor, the sensor becomes highly resistive and the motor protector switches off. Automatic restart to monitor after cooldown if the electronic lock of the output relay is released by interrupting the voltage supply. Ex works the lock-out bridge is installed at terminals B1-B2 of the motor protector. Alternatively the locked version can be changed to an unlocked version by removing the lock-out bridge. In that case the device shall switch itself on again after the cooldown. The relay switch output is designed as a potential free change-over contact.